The Cruze is dead in America. Why bring back the Cavalier? The last time the Chevrolet Cavalier was sold in the US was back in 2005. It was then replaced by the Cobalt which was succeeded by the recently discontinued Cruze. 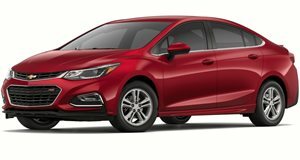 Sure sounds like GM, or at least Chevy, is done with the subcompact sedan segment in America. But is it, really? The Drive has discovered a trademark filing by GM, dated March 27, with the United States Patent and Trademark Office requesting the trademark rights to the names "Cavalier” and "Chevrolet Cavalier” for the purpose of "motor land vehicles, namely, automobiles, sport utility vehicles, trucks, vans, engines, therefor and structural parts thereof.” Does this mean the Cavalier nameplate will make a US comeback? Not necessarily. Automakers trademark or re-apply for trademarks for nameplates, whether they’re used in a production vehicle or not. They would much rather retain the rights then allow a competitor to potentially have them. It’s a common practice. But let’s also not forget that Chevrolet currently has a segment void in the US, of its own choosing. It’s entirely possible, though unlikely for now, Chevy will return to the segment. A more likely scenario, though not confirmed by the automaker, which refused to comment on future product, is a new crossover bearing the Cavalier name. We know GM will launch a new lineup of EVs based on a common platform starting in 2021 and, quite obviously, will need to name those vehicles. Given the popularity of crossovers, the main reason why the Cruze was dropped, and GM’s EV commitment, it’s entirely possible the Cavalier name will return as a small EV crossover. If Chevy can successfully revive the Blazer, once an SUV, and apply it to a crossover then why not do something similar with the Cavalier? For what it’s worth, the Cavalier nameplate currently lives on in Mexico and China. Both countries sell a small Chevy sedan called Cavalier, but we can’t imagine it’ll come to the US. That’d make absolutely no sense. GM finally has the groundwork to get into the hot hatch game!